the bugcast 317 – We’re up the swanee! 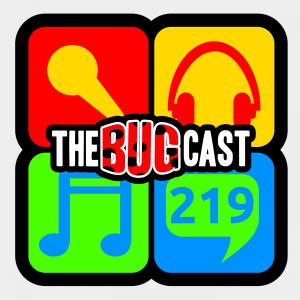 This week on The Bugcast: World Cup fever, Rik hits Bottom, we have a giveaway competition, and we play 8 cracking tracks of independent and Creative Commons music from Lyonn, Sam Brown, Bryyn, StarDust, Lejo Harmeson & Essence, Deathrow Pardon, Luke Spark and Longed for Fusion. the bugcast 267 – We’re a day early, but still rocking! This week, AMPed, Podcrawl, funnies and seriousness, and a very eclectic mix of 8 great tracks from Juice Big City, Ben’s Imaginary Band, Lejo Harmeson & Essence, Staggered Crossing, The Blue Stones, Idillicah, Knoxband and Jeremia. As the expected snowmageddon didn’t happen last week, the weather attempts to make up for it this week. So come along with us and warm up with some great music Mindflow, Star Destroyer, Kalen, Projektx-sound, Lejo Harmeson & Essence, Kartmaggy, Josh Woodward and Reckless Side. On this week’s show, we talk about obeying one’s vows, and play some very diverse music from Self Tort, Lejo Harmeson & Essence, Zero Project, Настя Ясная, Lull, Hudson K and Bowling For Soup.